Summary: Vampire mythology combined with the true history of Prince Vlad tell the origin of Dracula. Somebody had to stand up and take the vampire genre back to the good old days. Call me cynical and old fashioned but as a seasoned fan of vampire flicks I was kind of getting tired of seeing my favourite beastie being portrayed by a pretty boy Englishman who sparkled in the sun while fawning over a frowny, sullen chick named Bella. Well the man who was up to the task of injecting a little bit of gore back into the genre is first time feature director Gary Shore who has somehow managed to find the right balance to make Dracula Untold a pretty good popcorn movie with just enough of a body count to keep the cult fans happy. Dracula Untold takes vampire fans right back to the beginning, past Bram Stroker right back to the original myth of Transylvania’s favourite saviour, Vlad The Impaler (played here by Luke Evans). Vlad has brought peace to his homeland for a decade, but this is interrupted by the arrival of Turkish warlord Mehmed (Dominic Cooper) who once again demands that 1000 Transylvanian be turned over to his army, a fate that Vlad himself had been through as a child. While Vlad tries to negotiate to continue the peace Mehmed makes it personal when he demands that Vlad and his wife, Mirena’s (Sarah Gadon) son Ingeras (Art Parkinson) be the 1001st child handed over. This results in Vlad eagerly trying to find a new source of power to overcome the Turks… a dark force that he has previously faced in the mountains. There is little doubt that many people heading in to see Dracula Untold will be expecting something light and fluffy but instead Shore delivers up a film that sits someone in the realm of Forsaken: Desert Vampires and John Carpenter’s Vampires and that is certainly not a bad thing. There are a couple of easy to spot flaws in the plot but that is easily put to rest with some pretty impressive battle scenes and an air of suspense once you realise that this isn’t exactly a film that is afraid to bump off some of the main characters. To the screenwriter’s credit they also go back to basics. There is no mucking around with fancy plotlines etc Dracula Untold is a simple story of good versus evil with a healthy subplot revolving around family versus duty for Government members. The screenwriter does take the film to the darker side though, the decision for Vlad to use evil against evil is an interesting take the hero myth and a welcome move away from the squeaky clean image that a lot of heroes seem to have these days. The biggest weakness for the script though is the film’s finale, the scene set in modern times, which I’m not sure actually has to be there unless the producers behind the film are setting it up to be another Hollywood franchise. The darkness of the screenplay and plot is also brought to the fore by Gary Shore’s directional style. Some may criticise the dark style of the film, but for me it actually worked. Transylvania is in dark times and for a majority of the film the hero can only operate once the sun has gone down, hence filming in low light makes perfect sense and isn’t too much of a distraction for the audience. It’s actually a visual style not too dissimilar to the styles used in other medieval films like Season Of The Witch and Kingdom Of Heaven. As a first time feature director Shore actually handles the film pretty well and uses the countryside of his home, Ireland to good effect. As a result of how Dracula Untold turns out Shore is now a director that I am pretty keen to see what project he picks up next. The big winner out of Dracula Untold is Luke Evans. Questions were raised when it was recently announced he would star in the reboot of The Crow despite proof he likes the Gothic feel with his work on The Raven and his blockbuster appeal due to The Hobbit franchise. Evans’ version of Vlad The Impaler is pretty much a screen test for The Crow. The dark brooding hero, fuelled by revenge, if he wanted to show his worth to his critics out there he couldn’t have picked a more perfect vehicle, the good news is he does a pretty decent job as well. While Evans shines though his co-stars are not given a hell of a lot to work with. Dominic Cooper plays a smarmy one-dimensional bad guy while Sarah Gadon could easily have done more if she was given more characterisation as well. 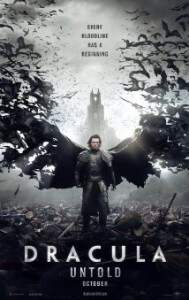 Dracula Untold is a fresh view of the original Dracula story. It is a fairly decent action film with a Gothic edge. Some of the popcorn brigade may be a little off put by the high body count and the few scenes of gore but in my book they are a definite plus. The great news is that Dracula Untold (much like Hercules earlier this year) isn’t the turkey that many expected and the vampires don’t sparkle. Other Subculture Entertainment Reviews of ‘Dracula Untold′: For our full Dracula Untold review please check The Good The Bad The Ugly Film Show Ep #99 . You can also read Dave’s Dracula Untold review on The Book The Film The T-Shirt.